There are lots of pictures out there for kids' bedroom design with beautifully themed rooms. This page concentrates on how a kids bedroom needs to be designed and laid out. Then you can go back to your pictures and decide on the look you're after. This page is part of the bedroom design series. Plan for a few years ahead. Plan for each of the kids bedroom activities. Use these kids bedroom design ideas to create as much space as possible. First of all let's think about the main activities that go on in bedrooms and how they should inform the design. Sleeping, dressing, playing and studying. When children (and indeed everyone) gets into bed they want to feel safe and cozy. A headboard goes a long way to promoting these feelings. If the bed is against a wall it can be fun if the headboard goes round the side and along the length of the bed. This is also a bonus if your child ever wants to read or study while sitting on the bed, or have friends into their bedroom as the bed effecitvely doubles as a sofa. Let's think a little bit about sleepovers. Obviously to dress you need a wardrobe or closet and the space to dress. Beyond that here's a few thoughts on dressing. Make sure there's privacy from the outside for getting dressed. If you have young children you may want to consider putting in a translucent window treatment so that your kids don't have to remember to close the curtains in order to keep things private every time they get dressed. If you're stuck for space and you're designing a bedroom for a small child measure the coat hangars you're planning to use. You might be able to get a wardrobe into a space thinner than the standard 24in (61cm) space. Do you plan to have 'deep' storage for clothes that are out of season, you know winter clothes and summer clothes? If so, you could think about having this space in another area of your home to maximize space in the bedroom. Now depending on the age of the child playing can mean very different things. It might mean Hotwheels or dolls houses. Getting older it might mean Lego or Miss World. Then at the tween and tween stage there might be hobbies to accommodate. Whatever the age there's often other children involved be it play dates or more like a social club! Playing needs space and storage. I'll say it again. Playing needs space and storage. Storage, storage, storage. To create space and storage consider installing bunk beds (even if the room is only for one child). Consider putting a few heavy duty hooks into the ceilings and/or walls (make sure these go into studs and not just plasterboard). These can be used for quickly rigging up dens, hanging hammocks or hanging swinging shelves, how about a swing? Study areas are most successful if they focus the mind by filtering out distractions. A desk is great up against a wall (or room divider) so that there's somewhere for shelves and maybe a pin board. If you can create a study alcove so that the desk has a kind of sheltered feeling with its own light source that would be a great place to study. It's always fun to move furniture around and if everything's on wheels it makes this even easier. The bigger the wheels the better (to be big enough to make the furniture easy to move the wheels really need to become a design statement). Make sure the furniture you buy (whether or not you add the wheels yourself) is sturdy - pushing it around will test those joints in the furniture. 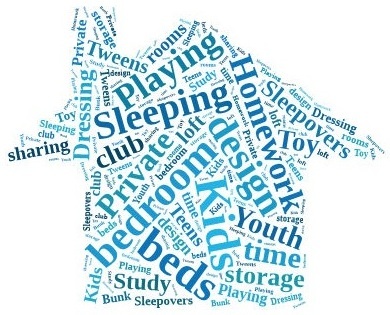 Mmm that heading implies war but whether or not a bedroom is a shared space it's always worth looking at ways that the space can be divided up because there's so many different activities that go on in kids bedrooms. I always like to try and keep the homework or study space somehow separated from the bed space. Studying can get stressful (especially around exams) and it often helps to be able to shut off the bed, or to shut off the study area. with a wall divider at the end of the bed - a desk or wardrobe at the end of the bed works well. with a curtain along the side of the bed. Putting the study are into a walk-in closet area and buying a wardrobe to sit in the room. You could replace the closet doors with a curtain if you like. Simply putting the study are out of site of the bed. Kids' bedroom design space requirements can often rival those of an adult couple, particularly if the kids are sharing. Sometimes it’s worth considering giving your kids the master bedroom. 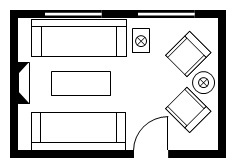 If there’s another bedroom that can accommodate a double bed and there’s a bathroom nearby why not use that? Especially if you could add an extra door to make those rooms more private. Maybe there’s another small bedroom that you could use for a dressing room. Using other small bedrooms and the family bathroom might turn out to be a great master suite! Bedrooms are usually upstairs. If you want to add a bit more space to a bedroom what design possibilities would open up if you opened up the attic space to the bedroom? You could create an extra floor level (called a mezzanine), open to the main bedroom space and accessed by a small staircase. The mezzanine would be a perfect separate area for one of the main bedroom activities (sleeping, dressing, playing, studying).